A Thursday night, a lovely warm evening in Leeds, and a packed Thai restaurant that looked like it should be in the back streets of Bangkok, a chaotic place packed with people and life, Thai signs everywhere in a jumble of gaudy colours, and an open plan kitchen crewed by a group of Thai chefs flinging noodles around in woks. Zaap Thai Street Food is brilliant. An assault on every single sense. 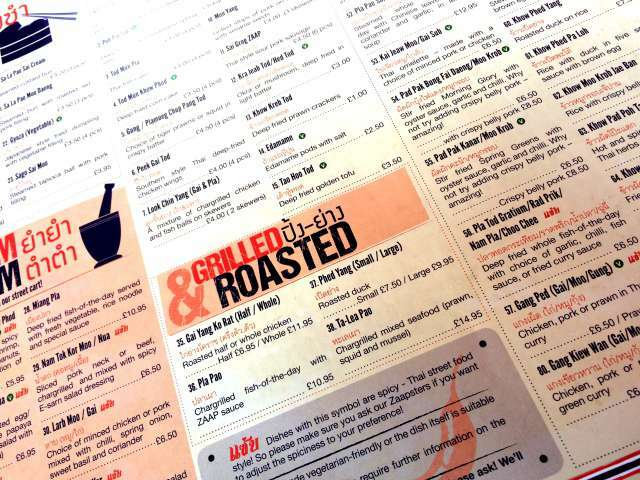 The food is – and I’m going to nail my colours to the mast here – the best Thai food I’ve had in Leeds, the UK, or anywhere outside of the street carts in Thailand that Zaap seeks to replicate. It’s very, very good, and the most authentic Thai food I’ve yet encountered that hasn’t actually been in Thailand. In Thailand, street food is an art, and there are small carts that expand into micro restaurants on every street corner. Spend any time at all in Thailand, and you quickly realise that these little street restaurants, nothing more than a stove on wheels and a collection of ramshackle tables, offer up the finest food imaginable, for pennies. The range and diversity of dishes is astonishing, and the quality of dishes difficult to comprehend. This is the sort of experience that Zaap seeks to bring to Leeds, and they do it very well. The menu is a sheet of A3 on which orders are scrawled, tables come loaded with chopsticks, there are a couple of Tuk Tuks dotted around, some converted into booths. Everything is a bit cramped to purposely heighten the bustle and the excitement of it all. And it works. It has atmosphere, and it’s tremendous fun. 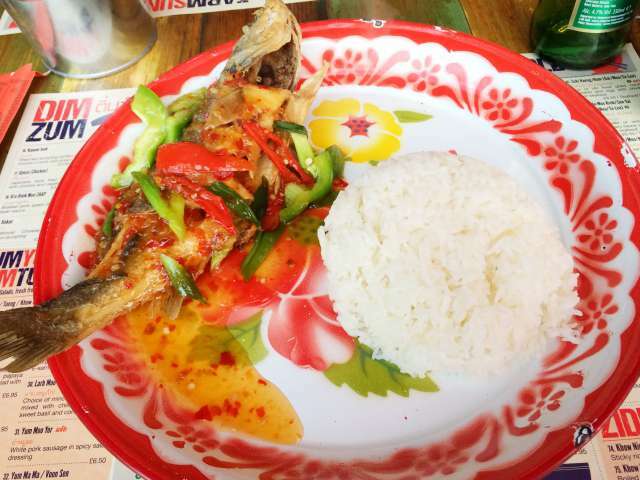 It’s hot and brash food, packed with chilli and fish sauce and lime, food with a real bite, food that does not mess about, not under any circumstances. Noodles, skewers of grilled meat, gyoza, green curries, red curries, deep-fried whole fish served with far too much chilli and attitude. There are prawns, soups, braised dishes, the smell of quickly fried ginger, garlic and chilli heavy in the air. And it’s cheap, too. Three starters, including some delicious battered prawns and a dish of slow braised pork belly, along with a couple of mains, with a glass of wine and a beer thrown in came to a little over £33. It’s a little bit more than you’d pay in Bangkok, granted, but very good value by Leeds standards, and excellent food by anybody’s standards.